I think some times people make stuff way too hard. I know I’m guilty! For example, eating well can be as easy as cleaning out the fridge or rummaging through your pantry. Blend 1-1 1/2 cups milk (I was going to use coconut water but I couldn’t remember how long it kept after being opened so I applied the when in doubt rule)…1 banana, juice of 1/2 lime, juice of 1 orange, 2c strawberries, 1 ripe mango…pretty much all the really ripe fruit in the fridge. Ya know what, it turned out pretty great and the freezer is stocked with 6 new smoothies to grab & go. In a small ovenproof baker, toss some thawed frozen peaches & blueberries, sprinkle with cinnamon (& brown sugar if you wish) and roast for approximately 20 min. 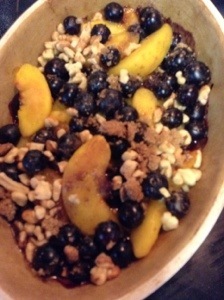 Prepared your oats however you normally do, but when you serve them up, spoon some of the yummy roasted fruit over them. Add staying power but tossing some roasted nuts on top! Here are a couple of recipes I came across on others’ blogs and I’m so glad I tried them! They are both so easy & delicious! 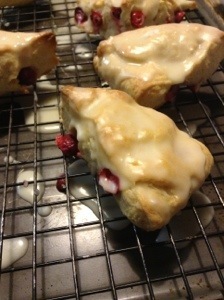 Fresh Cranberry Scones The the sweet citrus glaze on these scones balances out the tart cranberries to create a refreshing treat. These mini muffins from Serious Eats were so loved by my kids that when I lost my bookmark, I just spent half an hour tracking down the link. We liked them better the second day. I reheated them in the oven so they had a nice little golden crust. They kept for several days in an airtight container in the fridge.